Come and join us on top of the world! It is a pretty special place up here at Mt Buller, and we are always looking for ways to share great stories and photos and inspire people to come and visit - which is where we stand ready to help you! If you would like our help for a mountain story or need some advice - drop us a line, or take a look at this stash of great information loaded on these pages. 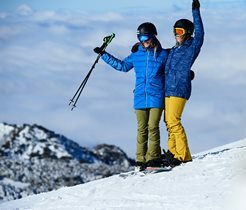 The Mt Buller & Mt Stirling Media Guides are available for download and crammed with the facts and information you need. Inside you'll also find a rundown of what's new at Mt Buller and handy details for your story. Follow the link to our online Media Gallery to access images. If you would like to visit please drop us a line. 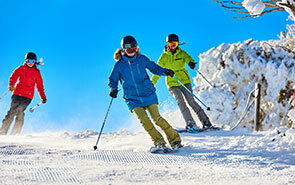 Mt Buller produces updated media guides each season with all you need to know about what's happening around the resort. Click here or on the image below to view a copy of the interactive 2019 Winter Media Guide. You can download a copy or skim it online. Press releases are added to the Latest News section of the website - click here to read the latest. In order to ensure the safety of our guests all drone useage, for both commercial and non-commercial purposes, at Mt Buller and Mt Stirling must be pre-approved, and comply with Resort and CASA regulations. Please visit our Drone Policy page to find out more.